Keep wildlife safe, especially in the Spring. With spring fully sprung, Marin county is playing host to many wildlife babies. 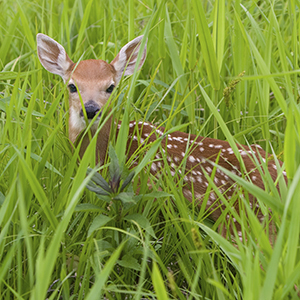 It’s not uncommon to catch glimpses of fawns, baby birds, goslings, and more. It’s one of the best parts of living amongst wildlife. We often receive calls from people concerned because they saw a fawn without its parent but the fact is wildlife parents often leave their young alone throughout the day, and sometimes for long periods. Mom or dad is almost always nearby and very conscious of their young. These animals are much more adapted for survival than most of us realize. While it’s appropriate to help a young wild animal that falls victim to pesticides, free-roaming dogs and cats, or cars, there are times when human intervention may cause more harm than good. Is he Coming toward you (approaching people)? Is he Covered with blood or insects? Has he been Caught by a cat or a dog? If the answer to any of these questions is yes, immediately call WildCare’s 24-hour Emergency Hotline at 415-456-7283 or Marin Humane at 415-883-4621. Please call before trying to help wildlife. Sadly, well-intentioned but uninformed people often harm or even kill animals with the wrong action. Out of respect for nature, human intervention should be the absolute last resort.